Here’s a look at what Max has needed since turning 4 months old. 1. Max is dribbling ALOT, damn you teething! The amount of normal bibs we go through a day is ridiculous and means my laundry basket is always full to the brim with vests and bibs. I’ve just placed an order with Jack and Jillaroo for some stylish dribble bibs which will hopefully save Max’s outfits and also my time spent washing and drying clothes. 2. As soon as I lay Max down on his back he gets very upset, all he wants to do is sit up. Mummy has a lot to do around the house and holding Max in an upright position all day just isn’t feasible so I need something that will help sit him up, that’s safe and secure. That’s where the Mamas and Papas Snug comes in. We had the bumbo but that was so small it didn’t last very long. The snug is perfect and even lasts up to 12 months and it’s brilliant for weaning too. Max also loves to sit and play with the play tray, keeping him occupied for at least 30 minutes. 3. I love reading to Max, I love the way he looks at me whilst studying my mouth. We can honestly spend a couple of hours reading books together. It’s one of my favourite things to do before bedtime and during the day. Here’s a previous post on Max’s already expanding book collection. 4. Can we all take a moment to appreciate this Jumperoo. All mummy’s everywhere probably share a sigh in relief over this baby product. It’s brilliant for Max to jump around and burn some of his boisterous energy and it also frees up some time for me too. He’s only ever in it for 20 minutes before he’s exhausted from all the jumping and screaming! 5. We’ve recently enrolled in baby sensory classes every Wednesday however these sensory balls to have at home are brilliant. We take them everywhere with us, as soon as Max gets a little fussy give him one of these balls and he’s a very happy bunny. He can spend hours just watching the lights and he loves the feeling of them against his hands. 6. As we’ve started weaning it’s really nice to have Max sitting up high in his highchair. It’s brilliant to have him in the kitchen with me playing with his toys whilst I’m getting on with my mummy duties. We have the Stokke Steps highchair which I couldn’t recommend enough. 7. We’ve had this Mamas and Papas spiral toy since Max was a newborn. It’s only now that he’s really interested in it. He absolutely hates his car seat so this is perfect to occupy him whilst in the car or pram. 8. And finally the Baby Bjorn Miracle Carrier. Now that Max can hold his head up he loves facing outwards especially when I’m out and about running errands. Not only is it good for him to look around and explore new surroundings but it’s brilliant for me to, carrying the extra weight means it’s almost like a mini workout! 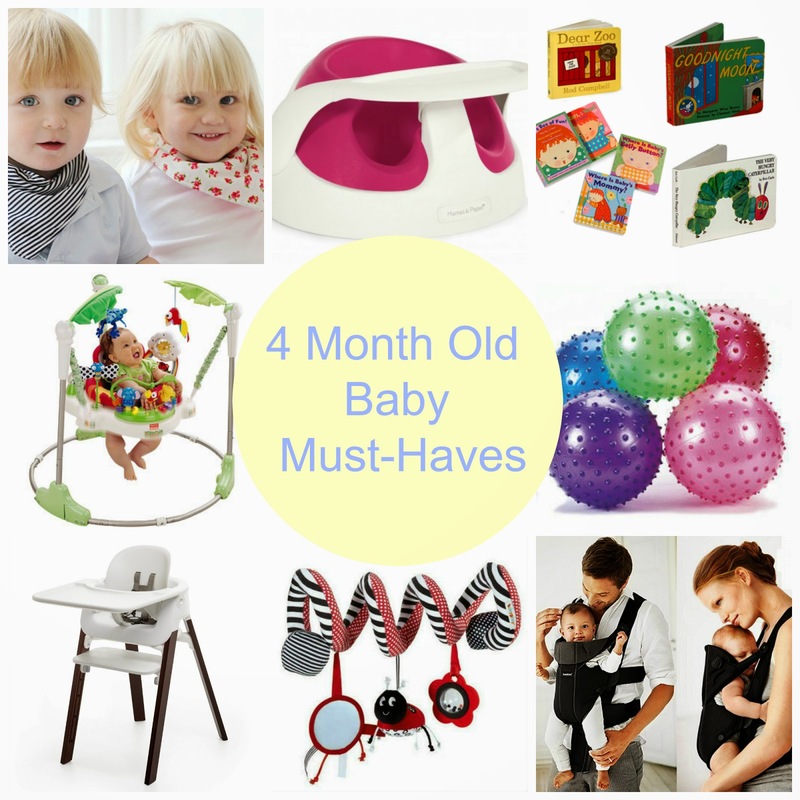 What are you 4 month old baby must-haves? Our jumper is the best purchase EVER. I love that thing. It has saved me multiple times when I need just a moment to throw something in the dishwasher, fold some laundry, or some other task that cannot be done with a clingy baby. Again, best purchase ever.